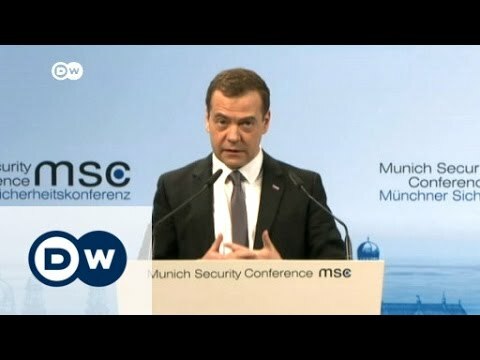 "Sometimes I wonder if it’s 2016 or if we live in 1962," Russian Prime Minister Dmitry Medvedev told the Munich Security Conference, Saturday. The world has sunk into a “new Cold War” as a result of the mounting tensions between Russia and the West over conflicts in Syria and Ukraine, Russian Prime Minister Dmitry Medvedev said Saturday. "We can say it even more clearly: we have slid into a new period of Cold War," he said, speaking at the Munich Security Conference Saturday. "Almost every day we are accused of making new horrible threats either against NATO as a whole, against Europe, or against the U.S. or other countries." Medvedev recalled that Russian President Vladimir Putin had told the same Munich conference in 2007 that the West’s building of a missile defense system risked restarting the Cold War, and now "the picture is more grim; the developments since 2007 have been worse than anticipated". He added that such policies in former Soviet states in eastern Europe were behind the tensions between Moscow and Western governments. "NATO’s policies related to Russia remain unfriendly and opaque… Sometimes I wonder if it’s 2016 or if we live in 1962." According to Medvedev, the Islamic State group “has to be grateful to my colleagues, some Western leaders who disabled such cooperation [between intelligence services]." His comments come a few days after he said that any ground troops in Syria would start a “new world war,” amid reports that Western allies Turkey and Saudi Arabia were preparing a ground intervention in Syria with the help of the U.S. in order to fight the Islamic State group. The Russian prime minister also slammed the West over the refugee crisis in Europe, claiming the crisis was triggered by the West’s "unsuccessful attempts to implant ‘Western-style’ models of democracy into an unprepared social environment." He added that the Schengen zone and the European Union are now bearing the consequences of such policies. “The Schengen zone might collapse. On our side, we are ready to help ease the migration challenges, including taking part in the normalization of the situation in the conflict zones where most refugees come from." Medvedev’s comments come three days after NATO chief Jens Stoltenberg announced the Western military alliance would increase its presence in the Black Sea, which surrounds Crimea.